A solar wind stream flowing from the indicated coronal hole should reach Earth on or about Jan. 2, 2011--the first solar wind stream of tthe New Year. Credit: SDO/AIA. These pictures are almost too hot to touch. Metallic photos of the sun make great Christmas gifts. CHRISTMAS LIGHTS: On Christmas Eve, a bright light will glide through the night sky over North America--and we don't mean Santa's sleigh. It's the International Space Station putting on a spectacular holiday show. Check the Simple Satellite Tracker or your cell phone for flyby times. Photo details: Canon EOS 5D MarkII and 500D. Sigma 8/3.5, EF 15/2.8, and EF 24/1.4L II lenses. "Auroras were dancing in the northern sky throughout the eclipse," says photographer Yuichi Takasaka of Yellowknife in the Northwest Territories of Canada. 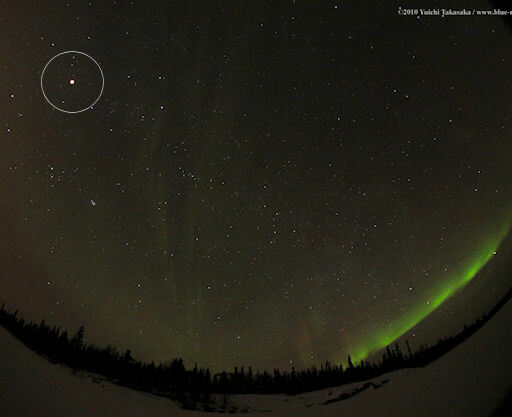 In the snapshot, above, the Moon is circled, apparently not much brighter than surrounding stars. A video prepared by Takasaka shows how dramatically the sky darkened while the Moon was inside Earth's shadow. "What a night!" On December 23, 2010 there were 1167 potentially hazardous asteroids.